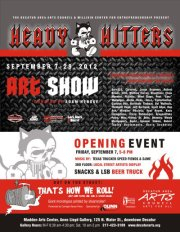 I exhibited in “HEAVY HITTERS II”, a huge group exhibit in Madden Arts Center at Anne Lloyd Gallery in September 2012. The list of fellow Artist’s is below and thanks goes out to Adam Henske of BURN 353 for the invite into the Exhibit! BURN353, EVOKER, CHRISRWK, JASON BRAMMER, ROBERT BOWEN, DANNY INTRO, MATHEW CURREN, MONTY MONTGOMERY, DOWNTIMER, PEAT WOLLAEGER, CHOWART , PL@STIC, MIND SLAPS, JUSTIN DIRKS, JOS-L JOSL, EYEFORMATION EF, CAMDEN NOIR, DONTHATE THEBEAR, COL WALNUTS, THEDEATH HEAD, JEFF BERTRAND, SCOTT ALLEN , DAN ASH, MICHAEL PAULUTZ, VYAL REYES, KAZU LIVINGSTONE, TRICIA REHKEMPER, GREGANDFAKE PETRE, LUCKYSTAR VITRIOL, EEKS ART, MACK KEREN.